A Fleetwood motorist faces a bill of thousands of pounds after getting his new Suzuki 4x4 stuck in the mud at Lytham. 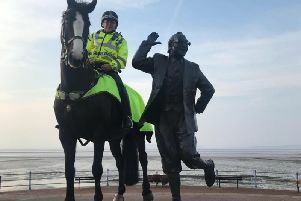 The 25-year-old was driving on the beach at St Annes yesterday when he decided to drive south to put his motor, which he’d only had for a number of days, through its paces, a Coastguard official said this morning. He was forced to abandon the car and get to safety, and now faces a bill when the car, which later overturned onto its roof, is eventually recovered. His insurance is unlikely to cover it because he was off-road, the official added.